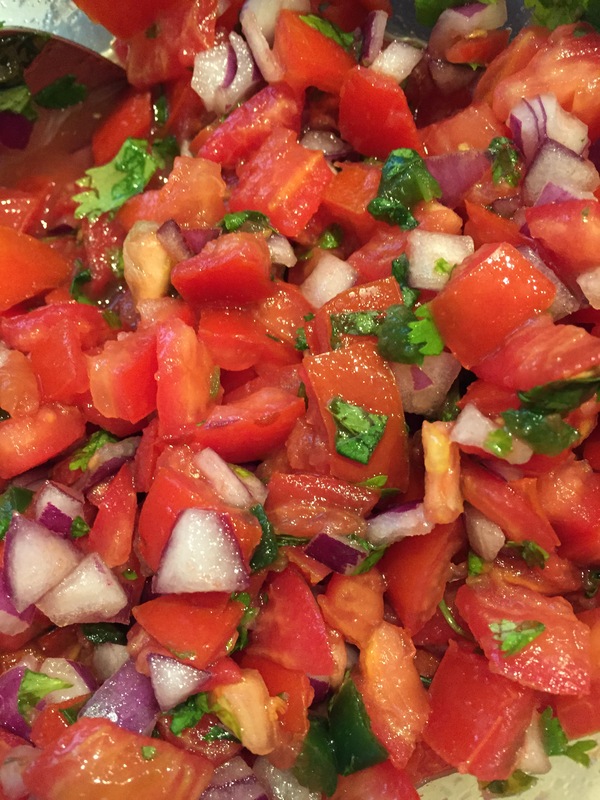 I love pico de gallo and am happy to eat it any time of the year. It’s so refreshing and depending on the heat of the jalapenos, spicy! Of course, I eat it with chips and then there are times I’ll make an open faced quesadilla and I’ll add a cup of this to the top, or top one of my bean burritos with this, or grilled chicken, or added to taco salad…it’s fairly interchangeable. It’s easy to modify and to make just a little bit, though I tend to make quite a bit because both Chris and I enjoy it and manage to eat it up in just a couple of days. Wash all vegetables and put off to the side. Using a large cutting board, chop and deseed the tomatoes and add to a large bowl. Remove the outer layer and ends of the onion, chop and add to the tomatoes. Cut the top off of the jalapenos, slice in half, deseed (or keep in for extra heat), and then cut lengthwise and crosswise to dice, add to the bowl. Chop up the cilantro and carefully stir all the ingredients together. Sprinkle with salt, stir, and sprinkle with more salt, per desired taste. Squeeze the juice of half a lime and stir again. Cover and refrigerate. NOTE: I sometimes add minced garlic or sprinkle garlic powder to this, as well.